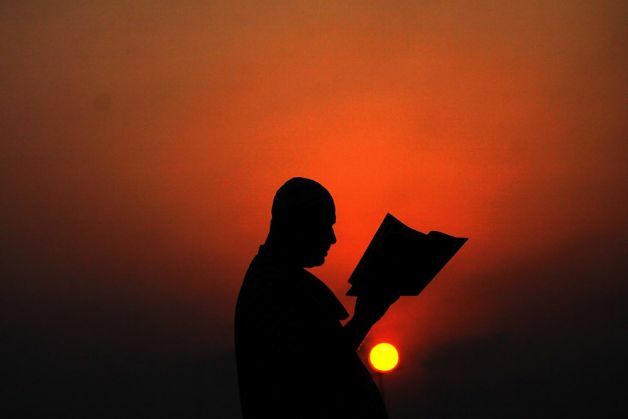 Practicing Muslims across the world are observing Ramadan. For one month, they are fasting between sunrise and sunset. But what do Muslims do in a town where the sun never really goes down? The town of Rovaniemi in Finland lies in a land of extremes. At 66 degrees north it straddles the Arctic Circle in Finnish Lapland. During midwinter it is cloaked in total darkness. But in the summer it is bathed in daylight. The long days pose a particular problem for fasting Muslims like Shah Jalal Miah Masud. Shah Jalal Miah Masud, 28, moved to Rovaniemi – 830 km (515 mile) north of the capital, Helsinki – from Bangladesh five years ago to study IT. He has not had any food or water for 21 hours. And he laughs. “It doesn’t get dark. It always looks like the same, the sun is always on the horizon and it’s quite difficult to get what the time is actually right now,” he says. It is 11:00 p.m. in the evening and the sun has only just dipped below the horizon. The sky has turned a beautiful deep, rich blue. This is as dark as it will get, then the sun will rise again in five hours. Shah Jalal Miah Masud says it is difficult to fast according to Finnish time and admits he is tired. But despite the hunger and fatigue, he says it is a pleasure to observe Ramadan during the long Finnish days. There is another option which reduces the number of fasting hours – mark its duration by the rising and setting of the sun in countries far to the south of Finland. Dr. Abdul Mannan – a local Imam and president of the Islam Society of Northern Finland – says there are two schools of thought. “The Egyptian scholars say that if the days are long – more than 18 hours – then you can follow the Mecca time or Medina time, or the nearest Muslim country time,” says Dr. Abdul Mannan. Dr. Abdul Mannan says the majority of Muslims in northern Finland observe either Mecca’s fasting hours or Turkish time because it is the nearest Muslim country to Finland. For Nafisa Yeasmin, a researcher at the University of Lapland, choosing when to fast has not been an easy decision. She moved from Dhaka in Bangladesh six years ago with her husband and two children. Her spacious Scandinavian-style kitchen – full of white cupboards and wooden work surfaces – smells of frying onions, turmeric, chilli and cumin. As she prepares her traditional iftar meal, she recalls her first Ramadan in Rovaniemi when she decided to fast according to Finnish daylight hours, going without food for up to 20 hours a day. “It was very difficult to follow because in Bangladesh we are used to 12 hours’ daytime and 12 hours’ night-time,” she says. Many Muslims come to Finland as refugees from all over the world, particularly Somalia, Iraq and Afghanistan. Since 2001, Finland has accepted 750 refugees a year. New arrivals are often sent to live in towns like Rovaniemi in the far north in a government resettlement programmes. In Rovaniemi the long days are not the only obstacle that fasting Muslims face. No shop in this town of 60,000 sells halal food, which is prepared according to Islamic law. The nearest town, Oulu, that does is 300 km away. Another option is Lulea, across the border in Sweden. Nafisa Yeasmin opts for Lulea, which is a six-hour round trip journey by car, with a shopping list full of items, including black chickpeas, dates, rice crackers and lots of halal meat. Understandably, she has stocked up for the whole month of Ramadan. To make her point, she opens her huge white fridge – covered in her children’s school photos – to reveal all seven trays crammed full of frozen halal meat. Yeasmin and Masud both enjoy life on the Arctic Circle and say local people are very welcoming and respectful of their religion. But they say it is hard to be thousands of kilometres from home, family and friends during a major religious festival. “We used to break the fast and share the iftar meal together. Now I do it on my own,” says Miah Masud.